Crafted in 18ct white gold channel set with dazzling diamonds, this elegant ring is the ideal way to celebrate your love. 18ct White Gold Diamond Channel Set Ring is rated 5.0 out of 5 by 11. Rated 5 out of 5 by Anonymous from Pretty ring - good quality Bought this ring for my wedding band. Really pretty ring with good size diamonds. Great thickness. Looks expensive and feels sturdy and durable. Rated 5 out of 5 by Anonymous from A ring I will love my entire life I bought this ring as my wedding ring and it is so beautiful. It fits perfectly with my engagement ring and is truly a gorgeous ring. 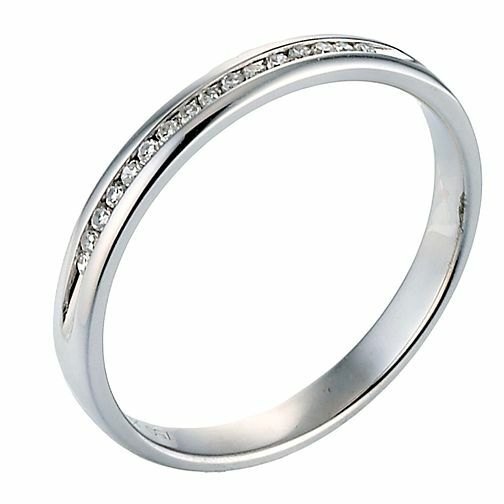 It is an accurate fit and has a gentle sparkle with the channel set diamonds. But is going to be a very practical ring to wear for the rest of my life. I can't wait to get married so I can wear it all the time- it was hard to take it off when I tried it on when it arrived. Soon I won't have to.